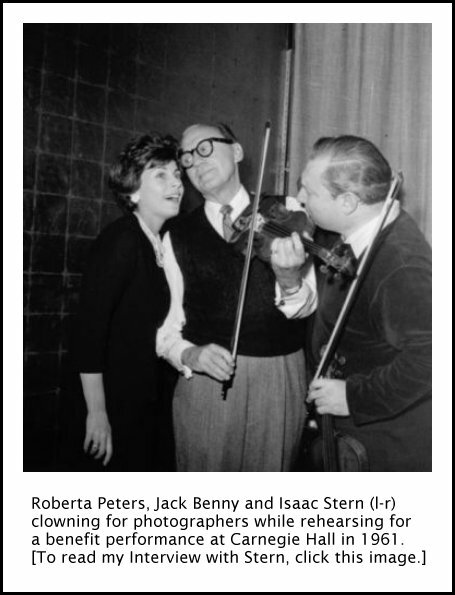 Robert Peters Interviews with Bruce Duffie . . . . . . . .
-- Text from a biography by Marsha Bryan Edelman on the Jewish Women's Archive website. 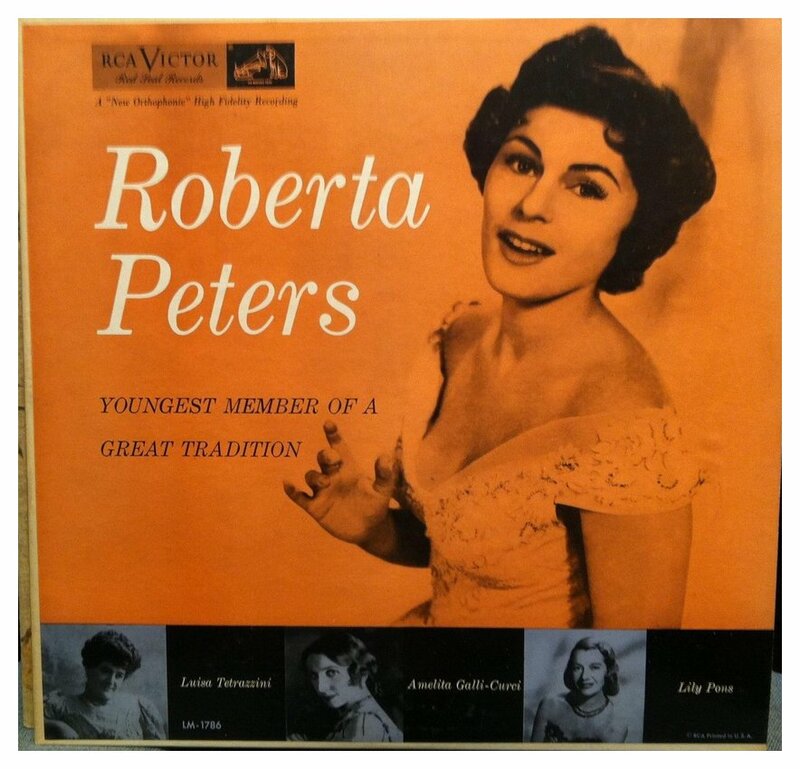 It was my distinct pleasure to meet with soprano Roberta Peters on two occasions nearly a dozen years apart. The first time was in mid-December of 1981. She was in Chicago with the young artist series sponsored by Bolla Wines. When it was appropriate, Peters even mentioned the sponsor a couple of times during the course of the interview! The second interview was after a rehearsal when she was opening the 50th Grant Park Summer Music Festival in June of 1993. Though she commented it had been a hard session, she was more than willing to chat with me again. 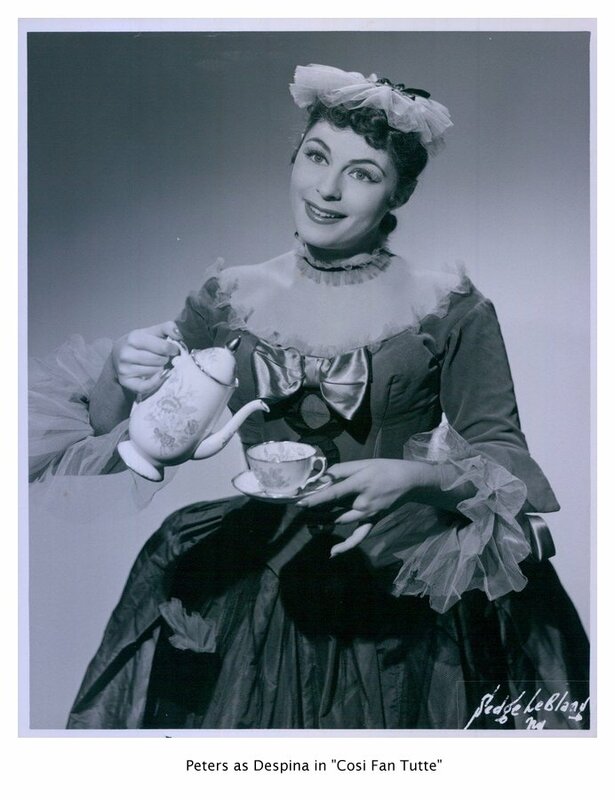 Both times she was bright and cheery, very much as one would see her on the stage in any of her happier roles. Her opinions were strong and she spoke her mind about many topics. Here are those two encounters . . . . . . . . .
Bruce Duffie: You are here to be part of a young artist series, and I’d like to begin by asking you how much can and should an experienced artist do to help the career of a young artist? 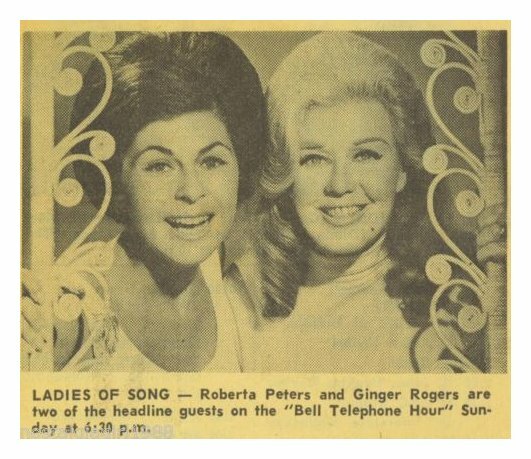 Roberta Peters: An established artist should do as much as they can, because they’re the future; they’re what’s coming up. We want to see opera continue. We want to see it grow. We have fabulous talent right here in the United States, and the more exposure they get, the more we can help them, and since we are in the public eye, the more we talk about it and bring them to the fore, the better it is for them and for us. RP: It’s changed considerably. In the earlier years it was all right if an opera singer just stood on the stage and sang out his arias. Today, a lot more is expected of opera singers, including being a decent actress. The acting is very important. The production is very important. The main thing is to have a good enough technique of your own so that you can adjust to all the changes. If you have to sing while not looking out at the audience, or if you have to sing with your back to the audience, or if you have to sing not looking at the conductor, you can do it with enough confidence. I just saw the rehearsal of the new production of the Zeffirelli Bohème at the Met, which is opening tonight, and there are many times when the artists are busy with the action. They’re not even looking at the conductor. BD: Is this a good step or a bad step? RP: I don’t think it’s bad if it’s done in moderation, if it’s done judiciously, not if it’s done as a ridiculous thing; “Caro Nome,” in Rigoletto, or “Mi Chiamano Mimi,” in Bohème, with their back to the audience, naturally not. Zeffirelli is very much aware of this, but it depends very much on the director. If the director is into opera, and he really knows, as Zeffirelli does, you can do that and make it very believable. BD: Many directors really have gone too far, then? RP: Oh yes, because a lot of those who have been chosen are not really into opera and don’t know opera. They know the story very well, maybe, but they don’t understand all our problems, all the different aspects. BD: How can you communicate to a director who is, perhaps, just learning some of the problems a singer has? RP: [Laughs] It’s difficult. You do the best you can, and it depends on the director and how much he’s willing to accept from an artist. You have to work it out together. BD: Opera has to be a collaboration? RP: Definitely, it really should, and I’ve found that it is a lot of the time. I’ve found very little of this temperamental stuff you think of. The artists themselves want the opera to be good as a whole. They want it to come across as something good, and within which they shine, naturally. But the whole is very important. BD: We’re getting away from stars as such? RP: That I don’t know. The public comes out for the stars, and good or bad, this is the way I believe that it still is. BD: How do we get more of a public to come out for young performers, the young artists? RP: Just this way, by the Bolla Young Artist Series, by having somebody in corporate America sponsor young people who are almost at the peak, who are ready to be heard by the major critics in the biggest and best halls in the United States. It’s a tremendous opportunity and a wonderful service that Bolla is doing. BD: Are there artists out there who should be making it, who are not? RP: I’m sure there are; there must be. I’m sure there must be. BD: I’m not asking for specific names, but because breaking into the business is so very difficult. You need to have the equipment, and yet you need the breaks. RP: You need the breaks. Timing means a lot, but being prepared, of course, is necessary. It’s the combination of things that’s so important, and luck plays a part. But you have to make your own luck sometimes. Bolla is helping by nurturing young artists. Bolla wines have to be nurtured. They make wonderful wines and they have to be nurtured, and that’s just how a young person, a young artist, has to be nurtured. You have to not let them get into it too fast and do the wrong roles, because then they’d spoil their voices immediately. I’ve seen so many come and go over the years, believe me, who do the wrong roles. BD: And some go too fast. RP: That’s it. Not only go too fast in the sense that they sing too much, and then their singing the wrong roles for them. Sometimes the manager needs a Brünnhilde, and here’s this young girl who may not be right for it, but she gets pressured into doing it. BD: Is it the fault of the managers, then, that they’re pushing the artists too fast, too far, too heavy? RP: It’s very difficult. Oh, it’s very difficult! BD: Is it more difficult for a young singer than an experienced singer to say no? BD: Someone to keep an eye and an ear on what’s going on? RP: Exactly. I’ve seen them come and go. They make these big careers; they shoot up, and five years later you say, “Gee, whatever happened to so and so?” because they’re gone. BD: How difficult the career that’s taking them around the world? Is it too draining on the young artist, especially? RP: It’s difficult on them. It’s difficult on your physical apparatus and your body to make the adjustment, and with the jets today it’s easy to run around the world. BD: Is it a bane as well as a blessing? RP: Sure, because you’re tempted to do too much. We all have that temptation. BD: As a singer, how do the different houses affect your vocal performance, when you’re in a smaller house or a larger house? Do you have different techniques, or do you just rely on the technique you have and hope that you’re heard? RP: I rely on my technique. I can be heard in any opera house in the world, big or small. I project to the last row, and I don’t think that it’s too difficult for me. BD: A theater that has twelve hundred seats is going to be different than the Met that has four thousand. RP: I don’t really make an adjustment in that sense. When I go out I try to hear myself, and I sing the same when I sing any opera. I don’t think of adjustments, to tell you the truth. I have my technique and that is my technique, and that’s the way I sing, big house or small house. Many of the European houses are smaller than ours here, so when their artists come over here, they think to be heard they have to push, to make their voices bigger to reach farther. But really they don’t have to do that. If they know how to sing they don’t have to push, because when you start to push your voice gets smaller instead or bigger! So you have to watch it and be very much attuned to it. 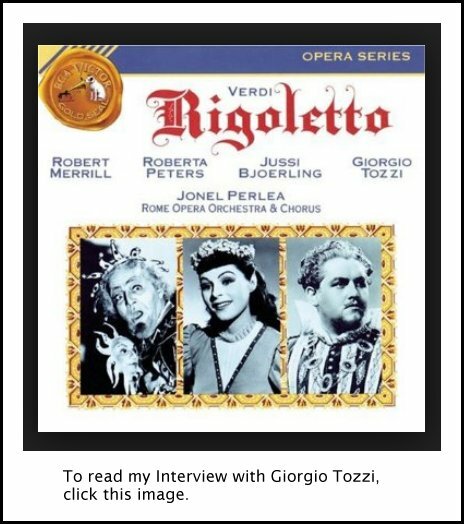 BD: Tell me about the differences of singing Bellini and Donizetti, and Verdi and Puccini. RP: Well, let’s start at the end with Puccini. Verismo, of course, is very different than singing the bel canto roles. However, again, your technique has to carry you in those heavier roles. For me, for instance, I’ve done very little Puccini. The only Puccini I’ve done is Gianni Schicchi and Bohème, and I probably will never do any other of the heavier roles. Although I adore Tosca and roles like that, my voice was just not made for that. I’ve just been starting in the last couple of years to do Mimì. Traviata I didn’t touch for many, many years. I did the first-act aria all over, of course, but the second and third acts are very heavy. So I have been very careful not to do heavy roles and in changing repertoire too quickly. That’s one of the reasons I really feel I’ve lasted as long as I have. I always call the Bellinis and the Donizettis a bath for the voice. It’s so cleansing. RP: And Mozart, of course. I know people have said that about Mozart, that it’s clean, but I feel that way, too, about those other roles. But your technique has to be just perfect for those. It’s so exposed and so open that you’ve just got to know where you’re going. Otherwise you’re just out there hanging in the wind. BD: Do you enjoy modern operas? RP: I enjoy some modern opera. Menotti wrote The Last Savage for me. [Photo at right, and also see my Interviews with Gian Carlo Menotti.] We did it at the Met in the sixties, but I haven’t been that exposed to other modern opera, contemporary opera, to tell you the truth. BD: When a young singer is approached to do various roles, it seems that they would rather learn Mimì, Tosca, Butterfly because they’re going to use these over and over again in their career. How do you convince the young singers to learn a new role that they may only do in one production? RP: I don’t even think it’s a question of that so much. It’s a question of those modern works being very difficult for the voice. You have to be very careful as a young person in some of these modern operas, because they’re not easy to sing. RP: Some of them can be because they’re twelve-tone scales, and for a young person the skips and the leaps are very, very difficult. There are some people who specialize in those roles now, mind you. RP: She was wonderful in that repertoire, and she’s had a great deal of experience. I haven’t really done any modern opera except for The Last Savage. BD: Lear mentioned that it would be good for young singers — or singers in general — in addition to scales and roulades to also practice tri-tones and augmented fourths and diminished fifths, the various things that you hear in modern opera, just to get them in the throat and in the mind. RP: It depends on how far along you are in your studies. As a beginner, you have to know where to start. You have to start with the usual books, the Garcia vocal techniques — at least that’s the way I learned — and then build up and study your Handel and your Bach. 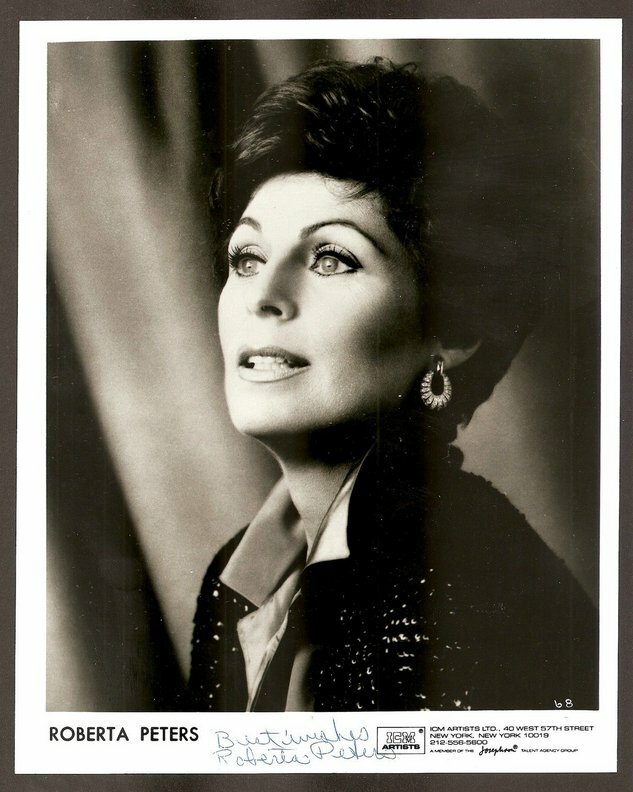 I was so very fortunate to start as young as I did, and with a teacher who understood that it wasn’t just opera that I had to study. I studied lieder and French art songs. I went around from teacher to teacher, a teacher for French songs and another for German. I studied with Lotte Lehman’s coach. His name was Leo Roseneck. He’s gone now, but he accompanied her and he accompanied Elisabeth Schumann. You’re taking from each teacher as much as you can and making it all your own in the end. There’s so much that comes before the tri-tones. If you’re going into the world of opera, it’s not just the modern opera. I think you should start with the old masters. BD: Then how do you get the young singer to sing roles that are not voice-wreckers, maybe lesser known Verdi or lesser known Puccini or works by lesser known composers? RP: You have to have a teacher that understands that those are important things to do. You have to rely on your teacher. That’s the key. I always tell young people that the teacher is the key. You have to get with a teacher who will first tell you the truth as to whether you should sing or you shouldn’t sing, which many teachers don’t even want to do, or are not capable of doing. With the voice, you don’t put your finger down on a key or on a string. You work through another person’s mind and heart, and it’s all semantics as to what it means to each person. What I say may mean one thing to you and it may mean another thing to me. So you have to try and get that across to the student, what you mean and how you’re expressing it. BD: Does the singer have to have a heart as well as a voice? RP: Oh my dear, I think so! It shows up, for sure, in your singing. BD: Do you approve of singing opera in translation? RP: Some. I like the comedies, especially. Comedies can really work if you have a super translation. I don’t like to hear La Bohème, for instance, in English. They did it at the Met once many years ago, back-to-back, one night in English and one night in Italian. The English you couldn’t give away the tickets, and the Italian was so sold out. BD: That was thirty years ago. Would it work differently today? RP: I don’t know. My preference is for it in the Italian, and there’s no reason why the audience shouldn’t enjoy it in Italian. I think that an audience has a duty not to just plop themselves down and say, “Show me.” They should read the libretto. They should know the story, because even if you sing it in English, when you have a duet or a trio, how do they know what you’re saying? Can you listen to all three people at the same time? BD: [Gently protesting] No, but at least you’re getting bits and pieces. RP: [With a big smile] All right, you’re getting bits and pieces. You can get the same thing in the libretto before you come to the theater and sit down. The original is so right, it seems to me, and it’s so much easier to sing. BD: Are the audiences more sophisticated today? RP: Oh yes, because of the advent of television and certainly the Metropolitan Opera broadcasts. People sit by the radio. I notice this because I travel a great deal and do a lot of concerts and opera out of town, and those Metropolitan Opera broadcasts are like life-saving things for people who love it. Years ago they were the pioneers, and now, with the advent of television and Live From Lincoln Center and the things you’re doing here in Chicago all help. So opera is alive and well, and doing quite well in the United States. RP: Personally, no. I find recordings very difficult. In the theater, you’re much freer, and in the studio it’s a little confining. BD: Now the other side of the coin. Do recordings serve a purpose? Are they a good thing or a bad thing for the public? RP: They are a very good thing. When I first started in the fifties, record collecting in those days was tremendous! 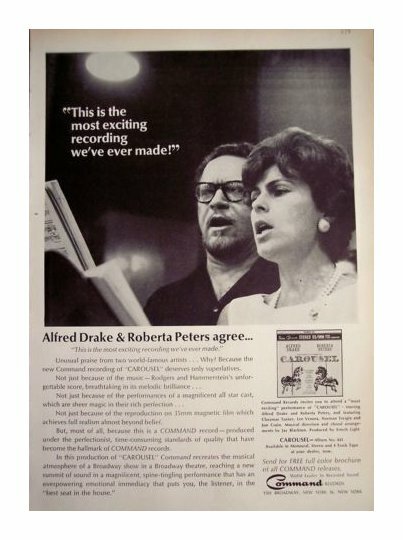 Those were the real hay days of the opera recordings. Today it’s become so expensive that they don’t make many recordings any more. But in the fifties and the sixties we made lots of recordings. I went to Rome with RCA Victor. It became too expensive over here, so then they got the studios over there in Europe, and they recorded over there. But I think it’s marvelous for audiences! Now, with the television, the records have leveled off a bit in popularity, opera records especially, which are expensive. RP: Well, you can always grow. I don’t like to listen to my recordings. I never liked to listen to my recordings because you always think you see something else that you want to do with it. So I can understand their point, but it’s extremely helpful for an audience who may never have heard a certain piece and want to learn and have it right in their own living room. 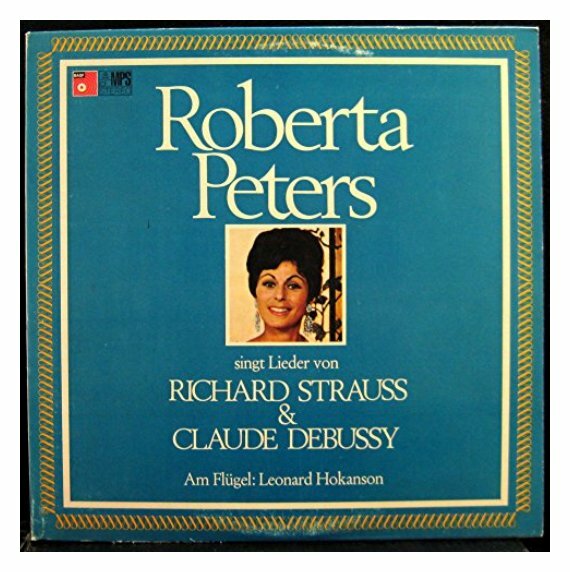 BD: What does the future hold for Roberta Peters? RP: I am still a very busy, active member of the singing profession. BD: Are you looking forward to a few new roles? RP: I hope so, yes. I’ve just started doing Mimì and Traviata. I hope someday to learn La Rondine. I love La Rondine. It’s such a beautiful role. This year at the Met I’m doing Rigoletto. I’m doing it in Boston, and in Cleveland, Minneapolis, and Detroit. So I’m still quite active. I’ve had forty-three concerts from September through May this year. BD: How do you balance opera and concert? RP: I’m doing a lot more concerts right now. I like both, but opera is really my first love. There’s something very exciting about recital. I just did a recital at Lincoln Center last week, at Alice Tully Hall, and I enjoyed it tremendously. RP: I like it. People come to opera in concert form. There is a big public for it, so it works. If the public comes, I think it works. Opera is so expensive to put on that it’s probably the reason that it’s done in concert form. I’m sure if people could put fully staged productions on all the time, they would. But it’s very expensive. RP: Ah, you’re sweet. Thank you. Nice to talk to you. We now move forward eleven and a half years . . . . . . . .
BD: What about a rehearsal makes it a hard rehearsal, more than just simply being long? RP: Well, the orchestra had not really read much of my music before. They were wonderful, really. They had great patience, and that was very important. But the conductor, too, hadn’t done this music that much. So I had to tell him how I do it. He was very much with me, which is nice. BD: So you helped to teach the conductor and teach the orchestra? RP: Well, I don’t like to put it that way. I like to feel that they’re doing it the way I’m used to singing it. Each artist does certain arias differently. The tempo is a little different, the dynamics, perhaps, are a little different. So we worked on all of those things. BD: Did you get it right, or did you get it close? BD: Is there just one right way to do it, or are there a lot of right ways? RP: There are a lot of right ways. That’s why I mentioned to you that everybody does it a little bit differently. I do the Mozart at a certain tempo, and maybe another soprano would do it at a different tempo. The important thing is to establish the tempo that you’re going to do it, so that it doesn’t go too fast or too slow. BD: You don’t want to be out of sync? BD: Has your idea of tempo changed over your long career? Would you perhaps have done it differently thirty years ago than you do today? RP: Each time I do it I have a different feel with it. It never becomes rote. It never becomes just the same thing one after another. For instance, I’ve done “Caro Nome” a billion times, but each time I do it I find something new, something a little different, especially if you know the words, if you know what you’re saying. This is what I miss a lot in young singers today. They have beautiful voices, but a lot of them don’t really know the style, and really don’t know what they’re saying. If you know what you’re saying, you say things differently every time. You say the same exact words, but you may say them a hair differently, so when you sing them it can also happen. You might give a little more emphasis here and there if you know what you’re singing about. BD: Do you look for it to be different, or do you just feel it differently? RP: You have to feel it differently. You don’t look for it. It either comes or it doesn’t come. However, being a musician you have to know the lines, the parameters. But within those parameters you have to feel it, really feel it, and know the style. This is terribly important. BD: You talk about knowing what you’re singing. Is it important to convey all of this to the audience? RP: You will convey it, even if the audience doesn’t know exactly what you’re singing. If you know here in your gut what you’re singing, it will convey something to them. Here in Chicago I’m doing six arias and an encore, and each one is a different style. I’m doing two Puccini arias, so that’s completely one style. Then I’m doing a Bellini aria which is bel canto, a completely different style. BD: That has the long beautiful line. RP: Exactly. Then I’m also doing Victor Herbert, so that also takes a certain style, and “Vilia” from The Merry Widow, which is the beautiful Viennese style. All these things cannot just sound alike. BD: They all have to be different, but isn’t it the composer, really, that made it different. BD: Is this too long a program, six arias? RP: It’s all on the first half, because the maestro’s doing Rite of Spring on the second half. So I will be doing three arias, and he will play something in between, and then I’ll come back and do the second three arias. No, it’s not too much. BD: If you’re doing six different numbers in three or four different styles, how is that different from doing one opera, which is a single-composer evening? RP: It’s very different. You stay within the style of that composer throughout the opera, for absolutely sure. BD: Is it better or worse, or just different? RP: It’s different. Opera is very different. You can turn around; you let somebody else sing. You take a little slug of water, or you can go off and then come back. Orchestra concerts are very demanding, or even more so with recitals because I do eighteen to twenty numbers. BD: But most of those are songs rather than arias? RP: Some of them are songs. Some of them are arias. I mix it up. So then again, each style is different. When I do recitals, I might do a French art song group of three or four numbers, so that’s one kind of style. Then if I do a German lieder section and some Handel, it’s other styles. I feel very grateful that I started as young as I did with a wonderful teacher, who insisted, in those early days of study, that I work at what I just mentioned — French art songs and Handel. All that was sinking in at a very early age, and it’s helped me an enormous amount. BD: So are you a specialist in general? RP: [Laughs] No, there’s no such thing. I do the best I can. BD: When you’re putting together a song recital, how do you decide which will go into this group, and which will go into that group? RP: There’s so much music in each one that you decide. You go over it with your accompanist, and there are lots of different songs. You pick out which you love, and then find which fits in where. BD: But for a group of Schubert, there’s six hundred Schubert lieder. How do you decide which of the six hundred? RP: You pick out what you like, and/or you learn something new. You figure out what’s good for the very first song. Do you want a slow piece to open? Do you want a fast piece to open? Then, what goes well with that first number? Does the second fit the program? It’s a lot of work. It doesn’t just happen! BD: Do you choose what fits your voice, what fits your personality, what fits the audience? RP: It is a combination, but more so what fits me, what fits my voice. BD: A more difficult question is how do you decide when choosing operatic roles? RP: I’ve been very careful over the years, and that’s one of the reasons I’ve lasted all this time. I didn’t ever do any heavy, heavy operas. I’ve seen so many singers come and go over the years because a manager said to them, “You can do this part.” Then, for various reasons — either they need the money, or they take the manager’s advice, or they’re not sure of themselves if it’s right for them — in a few years they’re gone because they have pushed their voices to the point where they can’t sing anymore. So I’ve tried very, very directly and cleanly and carefully to choose the right repertoire. BD: Have you always been right? BD: If you had, perhaps, a little heavier voice, do you think you would have gone into some of the heavier roles? RP: If I had the voice, yes. If the voice developed that way, but my voice stayed nice and high. I am doing things now that I would never have done years ago, for instance, Doretta’s aria from La Rondine by Puccini. Even Musetta’s aria, I never did! Imagine in all these years, such a popular aria and I never touched it. BD: I would have thought it would have shown up as an encore someplace. RP: No, unfortunately, because I love it now! It’s great fun, and I’ll be doing that tomorrow evening. BD: [Musing on the role] Musetta has to scream about her tight shoes. Were there any pieces where you had to scream? RP: No. I wouldn’t do anything like that. I used to do some of the summer operettas and shows, and I was offered Kiss Me Kate, but I would never do that. It’s a beautiful show, but it is a lot of screaming and running and doing all that kind of thing. That’s not for me. I’ve done King and I and The Sound of Music and Merry Widow. Those are the things I can do. That’s another thing. You have to know the works, and if you don’t know, then you have to get good advice from somebody else who knows what’s right for you. BD: In those musicals and operettas, you go from singing to speaking. How difficult is it to shift from singing projection to speaking projection? RP: It’s a bit difficult. You have to know how to project. You can’t over-project even in the singing. For instance, when you’re singing in English, it’s difficult to get the consonants out, and to get it so the audience really understands it. But the speaking can be a little difficult. You have to really work on that. You always have to support, support, support, and never speak on the cords. BD: Is it harder on the throat? RP: It is harder on the throat but [speaks in a high head voice] you can’t talk up here all the time. [Returns to her natural voice] You have to talk in a normal range. BD: Is it easier to go from singing to speaking, or from speaking to singing? RP: Singing to speaking is easier because you keep your voice all the way up and then you have to let it down a little bit. But if you speak first and then sing, you’re already down a bit, and it’s harder to come back up. BD: Of course, in an operetta or a musical you have to go back and forth, and back and forth. RP: Mm-hm, mm-hm. So, you just have to work on it. BD: Are you more tired, then, at the end of one of the musicals as opposed to an opera? RP: Not really; not if you study it and work on it and keep working on it and get it really in your voice. It’s one thing to know it musically, and it’s another thing to really have it in your voice. You do this by singing it and singing it and singing it. BD: I guess I’m just a little surprised that you would do musicals, only because you don’t have the typical Broadway-type voice. RP: These that I mentioned to you have some beautiful lyric music. The King and I is a wonderful role, in any case, and Merry Widow, of course, is sensational even though there is dialogue in that. BD: But that comes more out of the operatic tradition. RP: Yes, and Sound of Music I enjoyed very much the character itself. Putting on a nun’s habit and the whole wedding, it’s all very beautiful. I wish they had more shows like that today. There’s really nothing out there. BD: Are you constantly looking for the great American musical? RP: Not really, but I would like to see it there for the public. But it’s not the era. It’s the era of Tommy and that kind of thing. BD: Is it the era of Sondheim and Andrew Lloyd Webber? RP: Yes, sure it is. BD: Does that hold any interest for you at all? RP: Not really. I might sing a Sondheim song. I don’t really know too much about Lloyd Webber, but Sondheim has great talent. BD: Is there any way that we can get any of the public that goes to Phantom of the Opera and the other Lloyd Webber musicals into the Metropolitan Opera House and Lyric Opera of Chicago? RP: A lot of the people who go to see Phantom of the Opera think they’re seeing opera. “Oh, I went to the opera,” they say, and they’re so proud of themselves. So hopefully that will open a door a little bit. BD: Then when they go to the Met, are they looking around to see where the phantom is going to be tonight? RP: [Laughs] Maybe where the phantom is going to be, or where the super-titles are going to be. The Met does not permit super-titles. Does Chicago have them? BD: We’ve had them for several years, and they’ve been a wonderful hit. RP: They are a hit everywhere. I really wish the Met would do it. BD: Is it easier for you to project to the audience when they can see the text that you’re singing? BD: Then it’s better for you as a dramatic actress? RP: I think it’s good to have it, I really do. I didn’t in the beginning. 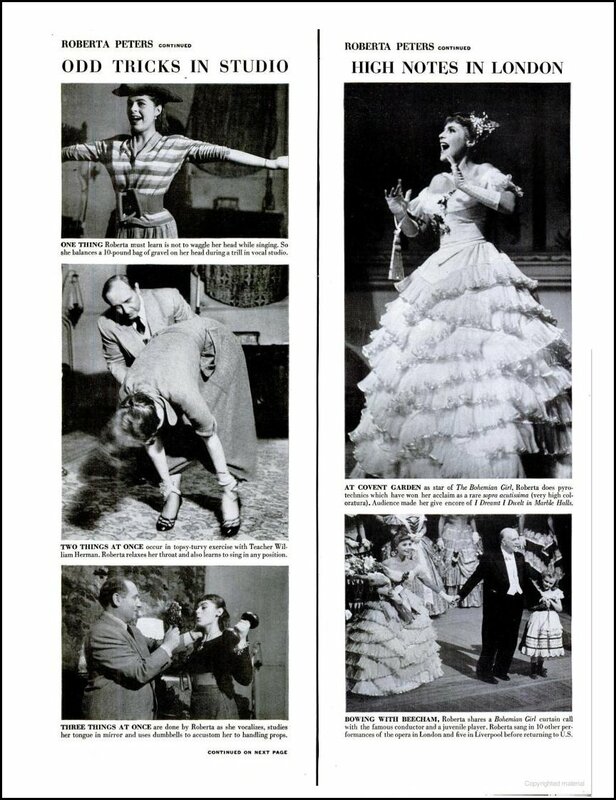 I thought the public should read the libretto and they should know what’s there, but I’ve heard so many people say, “My husband used to fall asleep when he came to the opera. Now he loves it because he’s seeing it.” So I think it would not be too bad of an idea for the Met to do, but they don’t wish to do it. BD: Are the super-titles going to mean the death of opera in English? RP: No, not at all. I don’t think so, but I don’t really like Italian opera translated. BD: Why not? Opera in English has been such a big success, especially in the regional theater. RP: It depends what the opera is. Mozart is wonderful translated. The comedies are great translated. 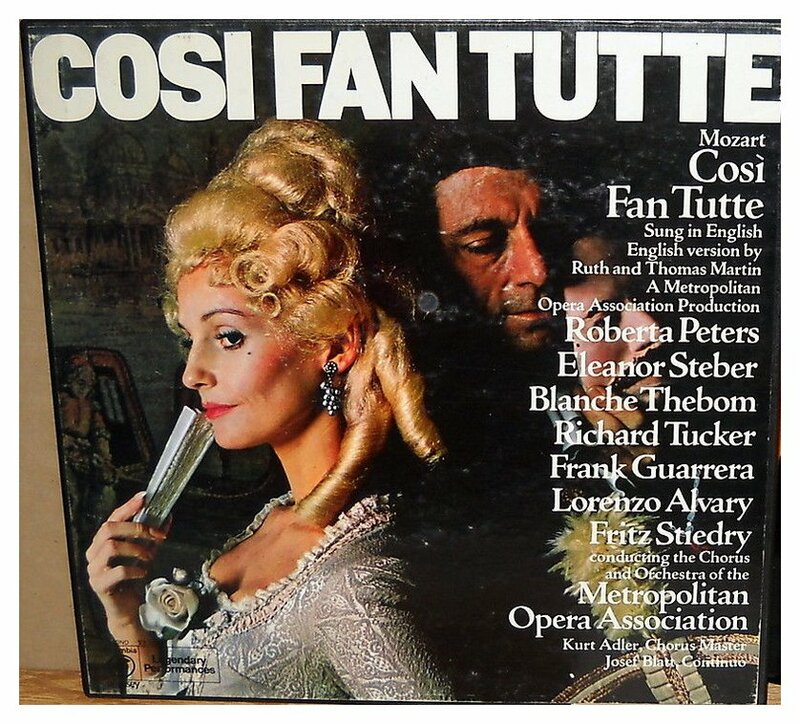 I did Così Fan Tutte in English at the Met with a wonderful translation. Eleanor Steber was in it. Do you remember that recording? To read my Interview with Blanche Thebom, click HERE. To read my Interview with Frank Guarrera, click HERE. RP: Those I would like in the English, but the tragedies like Lucia and Rigoletto, for me it wouldn’t be the same in English. It’s my schooling. This is a personal opinion. It is so much easier to sing. The Italian vowels are so beautiful. BD: [With a gentle nudge] Then should Richard Strauss have set his texts in Italian instead of German? RP: No. You have your own style. 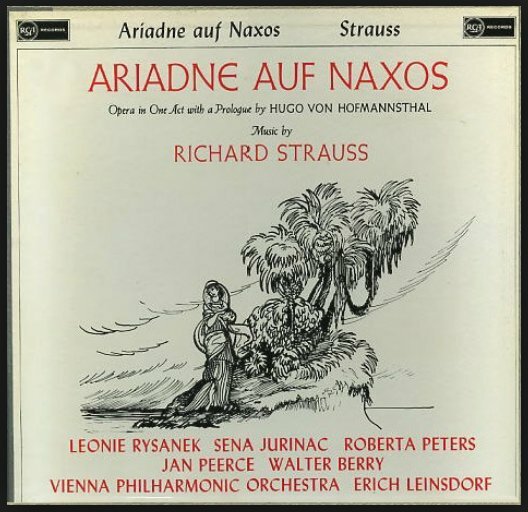 Strauss’s style is perfect in German, and he knew the female voice so well that he gave us some fabulous music. Zerbinetta’s aria, which I have on recordings, is one of my very favorites and the most challenging of any opera aria I’ve ever done. 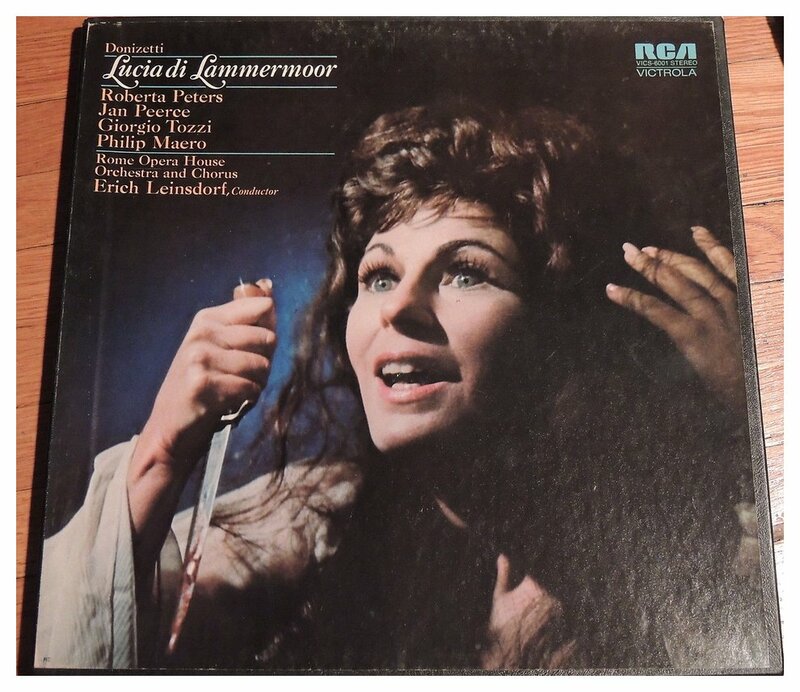 That and the mad scene from Lucia are the two most challenging roles. BD: For you and your voice, or just the most challenging for anybody? RP: I’m talking about myself, but I think most coloraturas would say that. BD: You were put into a series of roles because of your voice type. Did you like the characters that were imposed on those roles? RP: Actually, I did, very much! Wasn’t that lucky? [Laughs] The only role that I didn’t want to do in the beginning is Oscar in Masked Ball. But I came to love it very much, and I’ve done it quite often. Mr. Bing called me into his office one day and asked me to do it, and I said, “There’s another soprano in this opera, and I know I don’t have the voice for it, so why do you want me for this?” He said, “You’d be perfect.” So, I did it, and I’m not sorry. It’s a lovely part, and it can charm the public right off its seats. 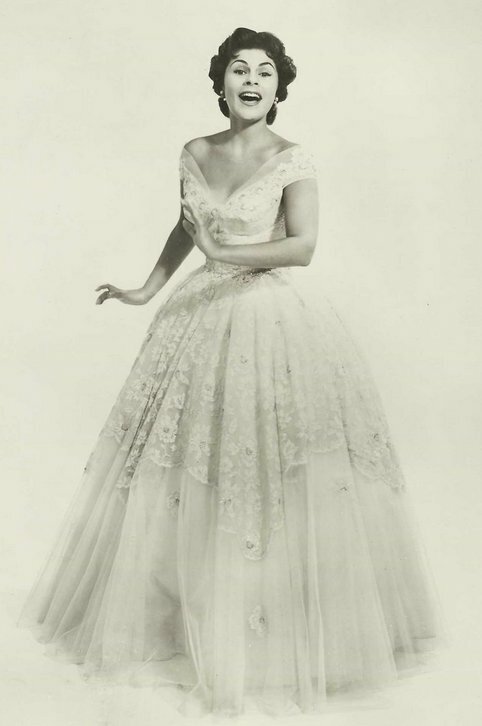 Talking about Ballo, I wanted to tell you that just recently, when Marion Anderson died, I was asked by the press to talk about her debut at the Met. BD: Were you in that performance? RP: I was in that performance that historic evening, and it was really quite thrilling! Ulrica has one scene, the one big scene in the second act, and she sits with the cauldron and goes around with her little shovel or whatever she has, and she has this gorgeous aria. Just as the curtain went up, the audience went crazy with bravos and applause. She could hardly start to sing. Then when we took our curtain calls there was a standing ovation. We just couldn’t get off the stage. [See image below] It was a great thrill. She had already been a little past her prime, though. She had been singing for quite a while. BD: But she could still handle the part. RP: She could handle the part, and I have to give Mr. Bing a great deal of credit because he opened the door there for many other black singers. We were both with Sol Hurok. I had met Miss Anderson before she sang at the Met, and she was a very retiring, quiet, reserved, humble person. She was a lovely woman. There was just a beautiful tribute to her at Carnegie Hall. It was so moving! They had a grand piano on the stage, and nobody sang. They had a little pool of light on the floor, right in front of where she would have stood. They played her Schubert recordings and her spirituals, and her Ave Maria was just the most touching I’ve ever heard. Everybody was in tears. She did have a gorgeous quality, very serene, gorgeous quality, I thought. BD: Coming back to you, do you feel that you have this kind of a voice which will move people, and will set them tingling? RP: I hope so. That’s my ambition. That’s my desire, as an artist, to put forth what the composer had to say, and do it with my own feeling for each number. BD: Let me ask a big philosophical question. What’s the purpose of music? RP: To enrich people’s lives, whether it’s the musician or the audience. BD: You’ve made recordings throughout your career. Do you sing differently in the recording studio than you do in the opera house or the concert hall? RP: Yes, I think you do. RP: I was just watching television the other day, and it wasn’t an opera performance in a studio, but one of the Broadway shows being taped. They showed the control room, and how often you had to repeat the aria, etcetera, etcetera. Watching them reminded me that there’s not the spontaneity. You have to try and create that, but there isn’t the spontaneity that an audience can give you, the vibes from an audience. I had a very interesting experience in doing Magic Flute for Deutsche Grammophon with Karl Böhm. We recorded it in a little church in Berlin called Jesus Christus Church and the singers were upstairs in the balcony. The orchestra was downstairs, so that’s quite far away. We did the second Queen of the Night aria in one take! Luckily, it just worked. It was some kind of miracle, because I recorded it before and afterwards, and sometimes the orchestra or somebody has a bad note, but luckily the balance was good and the engineering was good, so it just was very fortunate. It worked. It’s a great aria, too. BD: That is the one with all the high Fs. RP: High Fs, yes. That’s the aria that I auditioned with for Mr. Bing. My story is really very funny. I had never sung for anyone in all the time that I was with my teacher from the age of thirteen. 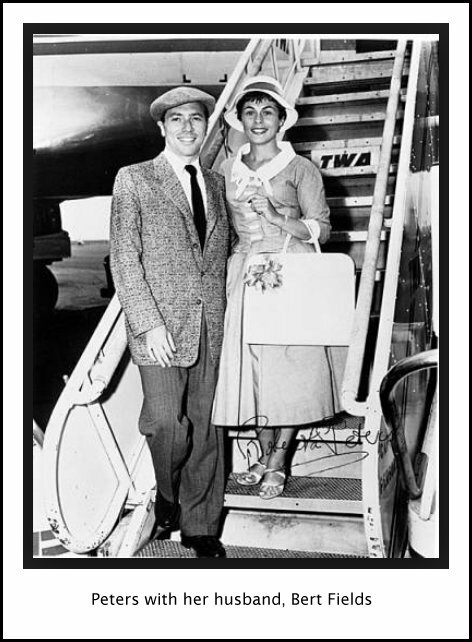 When I was ready, Mr. Hurok came to hear me sing through Jan Peerce, who was a friend of our family. Hurok then arranged for an audition with Mr. Bing. BD: So it was Peerce that said to Bing, “You should hear this woman,” and then you had to deliver? RP: Exactly. Oh, you bet! I was never so nervous, because I hadn’t sung for anybody. Anybody! All through the six years or so I was studying with my teacher. BD: How old were you at that time? RP: I was eighteen and a half years old. 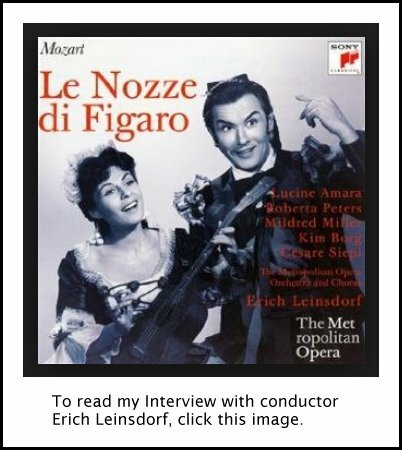 So the audition was arranged, and Martin Feinstein — who is now the head of the Washington Opera — went with me that day, because Mr. Hurok was out of town. [See my Interview with Martin Feinstein.] 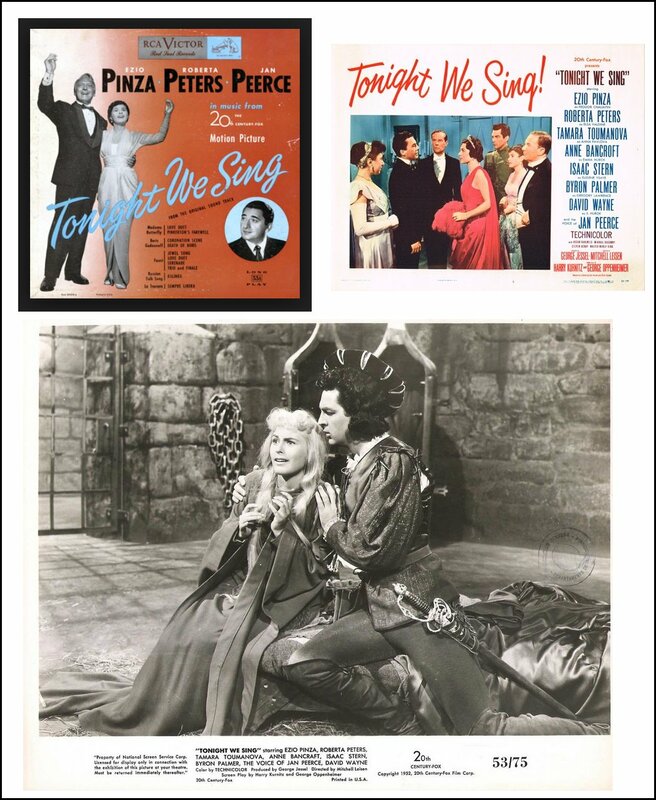 Bing was just beginning his tenure at the Met, and he wanted The Queen of the Night aria. 1950-‘51 was going to be his first season, and he was looking for a Queen of the Night because we were going to do a new production of Magic Flute. BD: Was it going to be The Magic Flute and not Die Zauberflöte? RP: Die Zauberflöte. It was going to be in German. BD: In the mid-fifties it was sung there in English. RP: Yes, we did it and I learned it in English, but I did the audition for him in German. So I went out on the Met stage with just a light, and I sang The Queen of the Night aria. The house was dark, and when I got through the first time, from one section of the orchestra I heard a voice say, “[with an English accent] Miss Peters, would you mind repeating that one more time?” So of course I did it again, and then when I finished, from another part of the house I heard, “Miss Peters, would you mind doing that one more time?” I did it four times, and what I didn’t know was that Mr. Bing was calling in different conductors who were in the house rehearsing, to hear it. When I got off the stage I had my contract! [Laughs] But you can imagine how nervous I was. BD: Is it at all possible, by any stretch of the imagination, that someone who is eighteen or nineteen years old today could do that kind of audition? RP: It’s possible. I wouldn’t say it’s impossible. BD: Would it be smart for any eighteen- or nineteen-year-old to do that, or should he or she wait until they are through college anyway? RP: It depends. Perhaps if it’s a coloratura voice, a lighter voice. The other voices do develop a little later, but maybe if she’s had the background that I had. I had the most wonderful teacher you can imagine, who knew exactly what to do! He sent me to an Italian teacher, a French teacher, a German teacher for language itself, not just for the particular music. I went to this Italian teacher for stage direction, too. RP: Stage presence, stage direction. For instance, if it was Barber of Seville, she would put on a recording, and I would turn one way and sing Rosina — not full voice, of course, but to her — and then I would turn the other way and sing Figaro and all the other parts, so that I knew them intimately. I knew what they were saying and how they were supposed to say it. So if someone who had been taught like that would have a great opportunity to audition at the Met, I would say to do it. Even though I was nervous, the teacher instilled in me enough confidence so that I could do it. I had a fabulous, fabulous education. I stopped school to study all this. BD: You immersed yourself in just this. RP: Completely. I was not with youngsters my own age. I didn’t go to proms. I loved what I was doing. I loved my teachers. BD: Is this possible or even advisable today, really? RP: It depends. If they have that kind of training — which I don’t see happening anywhere — then I would chance it. I would. BD: So when you were twelve or thirteen you decided you were going to be an opera singer, and that’s it? RP: When I went to my teacher, yes. I didn’t know at that time, but when he heard me sing, he said he had great confidence in me, and I just ate it up. At that age you’re drinking it all in. Your brain is receiving all this, all the languages, all the music, all the styles, so that something comes out after a while. There’s so much going in. BD: As you progressed, if you had gotten to be fifteen or sixteen and he thought you wouldn’t have had a world class career, would he have said, “Go out and do something else”? RP: I think he would. He was very honest. I had a lesson six days a week. 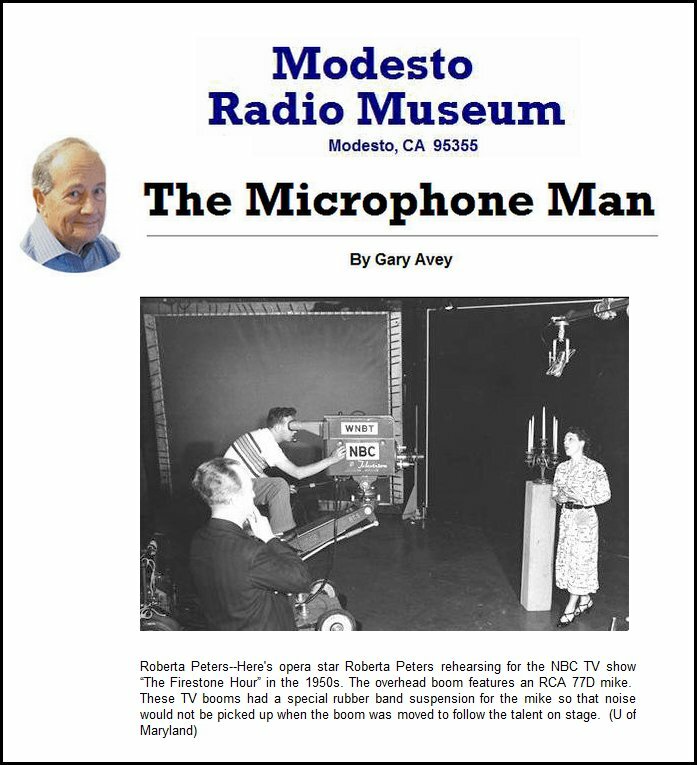 I would sit in his library and listen to all the beautiful recordings of Galli-Curci, Tetrazzini, Barrientos, so I was just thrilled with all this kind of thing! I didn’t know anything else. 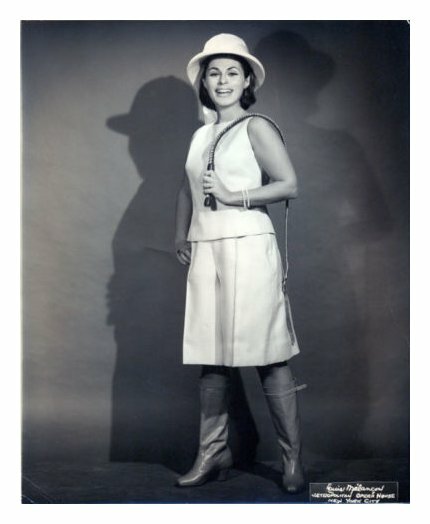 BD: Without naming names, are there singers who are taking from that tradition of Galli-Curci and Barrientos, through Roberta Peters and those who sang in the fifties and sixties and seventies, as you did, who are now continuing through the eighties and nineties and into the next century? RP: That’s a difficult question. I think there are some, yes. There are a few, very few, but the reason there are a few and perhaps there could be more, is the level of teaching. The teachers don’t do what I just said my teacher did, for various reasons. Money is a problem, today. By the way, my teacher gave me a half scholarship because both my parents worked. They paid what they could and he took care of the rest of it. So that could possibly be one of the reasons. The other reason is that the teachers themselves don’t have that background. In other ways I was fortunate. When I first started to study in the middle forties, a lot of middle European conductors, pianists and accompanists, came from Germany and Italy because of the Second World War. We had the advantage of their experience because they lived in the opera house. They knew what was going on. For instance, I had Leo Roseneck who taught me a lot of German lieder. He was Lotte Lehman’s accompanist and he’s on a lot of her old recordings. He was about eighty at that time and I was fourteen or fifteen. BD: Did you understand at fifteen what you were getting? RP: I think I did up to a point, as much as I could at that age. But he took the time with me to talk to me, and to bring me into that whole picture of Lotte Lehman’s time! There’s not that today. It’s very difficult to find that today, so that’s another reason, perhaps, that the teachers are not producing. The voices are there. There are some beautiful voices. BD: The raw voices, the raw talent? RP: Mm-hm, mm-hm. Very often I hear singers and they have gorgeous voices but they don’t know what they’re doing. Nothing comes across, or not much comes across. BD: It’s just a pretty voice? RP: Yes. There are lovely voices such as Renee Fleming, Dawn Upshaw, Carol Vanness. These are beautiful singers. BD: But they’re already, at least partially, established and on their way. BD: So you’re optimistic, then, about the future of opera? BD: Boy, that was a hesitant yes! BD: He is wonderful. We’ve been so lucky to have him here in Chicago for much of his career. RP: Yes, I know that. Isn’t he marvelous? I’ve done Lucia with him, and a few other things. So yes, I’m hoping that I say it only with a little trepidation because I would very much want there to be a resurgence of opera, and a continuation of that beautiful tradition. BD: Is opera on television helping or hurting the cause? RP: Helping. Helping, helping, helping, because they see that it’s a story with music, and it doesn’t become so forbidding to them. BD: It’s my theory that people were seeing the opera on the television and seeing super-titles, and then they went to the theater and missed the super-titles. That’s why they were so easily accepted in most of the theaters. RP: You’re absolutely right. Sure. RP: Oh, yes. Oh, yes. It’s got to be. It’s such fun. It’s uplifting. It’s challenging. You have to have great concentration, but it’s very rewarding. BD: Thank you for all of the music that you have given us, and all of the music still to come. RP: Oh, you’re very kind. Thank you. Nice to talk with you. These conversations were recorded in Chicago on December 13, 1981 and June 17, 1993. 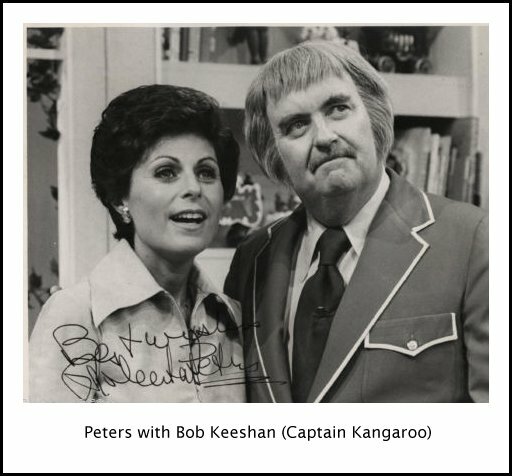 Portions were broadcast on WNIB in 1985, 1990, 1994, 1995, 1997 and 2000. An unedited audio copy of the second interview was placed in the Archive of Contemporary Music at Northwestern University. This transcription was made in 2015, and posted on this website at that time.